There will be Public Information Exhibition on the proposed Chowns Mill Roundabout improvements on Friday 6th April (2pm - 8pm) and Saturday 7th April (10am - 4pm) at the Park Road Baptist Church, Park Road, Rushden. Work is currently scheduled to start in December 2019. 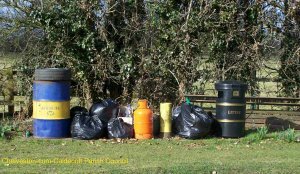 The annual parish litter pick (Operation Spring Clean) will take place on the weekend 14th and 15th April 2018. We can lend you the gloves, litter picks, bags, if you can volunteer some time over the weekend. It can be in your own street/road/lane or just a part of the village that you enjoy walking through! Please see the risk assessment on the link below. 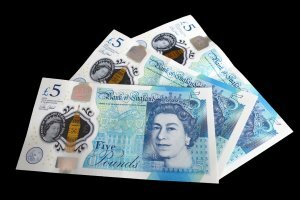 The Council Tax bills will be arriving through your post box shortly, and for residents in East Northants, ENC has provided a leaflet showing the percentages that each Council receives. 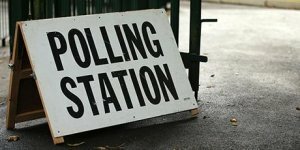 The figure of 6% quoted for Parish and Town Councils is an average across the district. The actual figures for this parish are that the Parish Council only receives 3% of the funds. The Council has been quietly using Twitter as a Social Media platform for the last year, as an experiment to see how easy (or hard) it would be to keep residents up to speed with local events via Social Media. At the March Council meeting, after reviewing a year of Council activities, the Council formally adopted a Social Media policy and agreed to make the Twitter account more public. 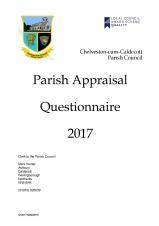 The deadline for returning the completed Parish Appraisals has now passed. Many thanks to the 50% of the households that took the time to respond. The results will now be analysed for presentation at the Annual Parish Assembly on the 23rd April. Results of the District Council Higham Ferrers Lancaster Ward. Results of the County Council Higham Ferrers Division. The 4 way traffic lights at the Anglian Water roadworks on the B663 between Raunds and Chelveston are stuck on red in all directions. Anglian Water have been informed and are sending contractors out to fix the fault. The fault has now been fixed.